The North American Free Trade Agreement, or NAFTA, is a free trade agreement between Canada, Mexico, and the United States. 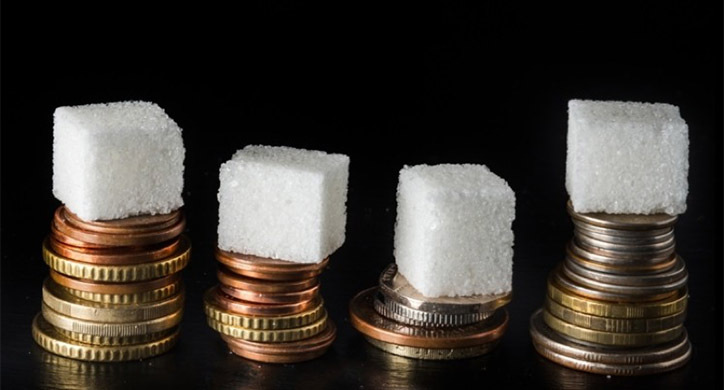 How does it impact price and availability of food? At D2D, we wanted to explore the role international trade plays in bringing food to your dinner table. You can buy most fresh food all year round largely because other countries can either grow them cheaper than the U.S. or have growing seasons that are opposite of ours. Trade provides the best possible price for the products we want by moving food from where it is grown and produced to where it is eaten. It is an efficient, universal means of bringing balance to supply and demand, and taking the wild swings out of our daily food prices. Those opposed to NAFTA, on the other hand, argue that the influx of produce from Mexico or Canada negatively affect their prices. For instance, the avocado farmer in California is able to sell the farms produce at a premium if avocados are not being imported from Mexico. However, NAFTA and trade with other countries have encouraged farmers to be more diverse and versatile in their farming practices. Today, some avocado farmers in California are adapting by diversifying into coffee plants. How much your food costs or whether you can get your favorite produce out of season is very important. Agriculture is an intertwined network of farming, crops, transportation, water usage, labor, and processing. Since crops require different growing environments, food is not often grown in the same location as where it is consumed. We all know that blueberries don’t grow in North Dakota in December, and wheat is not grown in Florida…ever! Different climates with different growing conditions in Mexico, the United States, and Canada can give us the best prices for available produce and the most sustainable agricultural supply chain. The North American Free Trade Agreement is one of the most important tools used by the United States, Mexico and Canada in maintaining exactly this sort of open trade. It was put into action in 1994 as a bipartisan effort originated by President Reagan and signed into law by President Clinton. NAFTA created a trilateral trade block designed to help ease product movement across borders in North America. 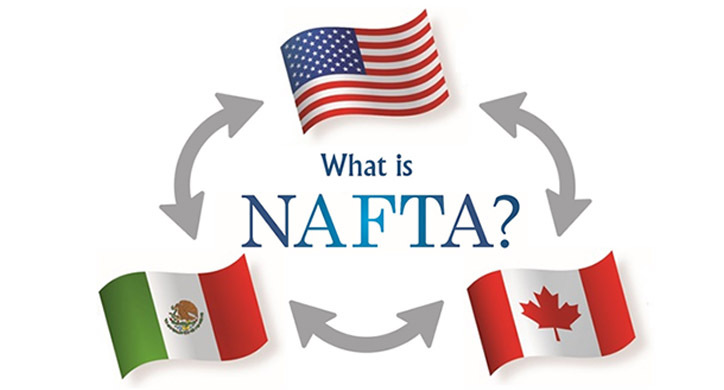 In simple terms, NAFTA was based in the belief that trade would help generate mutually beneficial economic growth by better enabling each country to use its natural advantages in various economic activities to find larger, more rewarding markets. And in the process, consumers would reap substantial benefits, too. 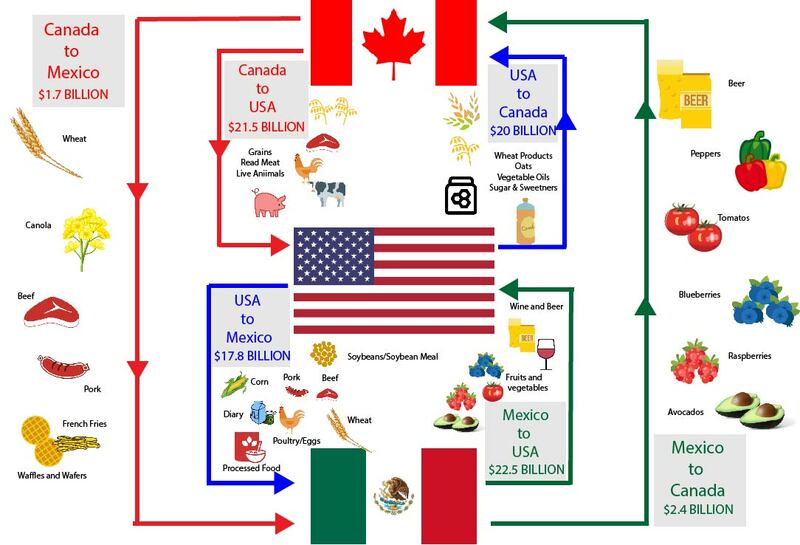 Billions of dollars worth of agricultural products are traded between the US, Canada, and Mexico. 1. It eliminates taxes (tariffs) on all imports and exports coming across the borders. To confirm this, exporters must get a certificate of origin that states the product was made or grown in the U.S., Canada, or Mexico. 2. All three countries have a ‘most favored nation’ status. This means that every business and product gets the same treatment from the governments regardless of which country it originated. 3. Government policies and environmental and labor laws are respected. That also includes all patents, trademarks, and copyrights and ensures that they are respected among the countries. There are also specific rules in place to prevent any trade disputes. 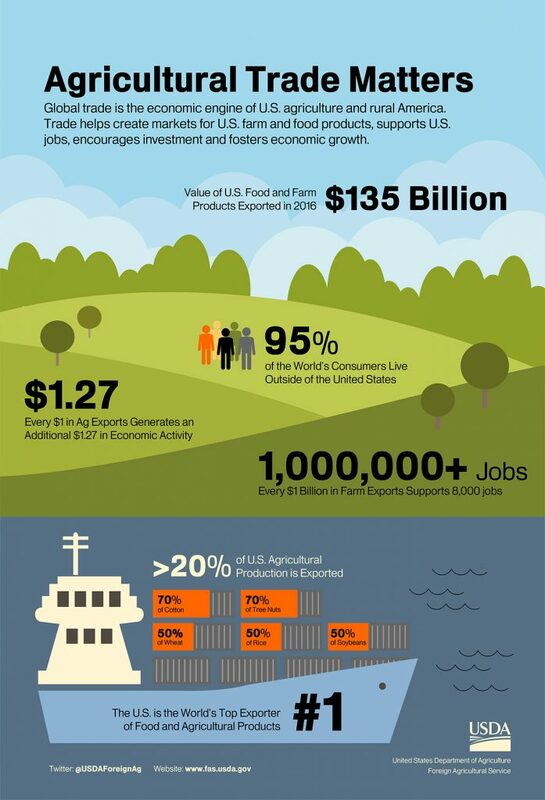 Since 2010, the U.S. export of agricultural goods has averaged $140 billion. We export the most to China with Canada and Mexico coming in a close second. Without the strong North American trade partnerships, our agricultural exports could decline up to $40 billion in revenue. Let’s put NAFTA into perspective— here is how it affects your kitchen. You love breakfast and enjoy frying up some bacon and eggs every morning. But how did that pork end up at your local grocery store? Your bacon probably started its life as a piglet in Manitoba, Canada; was then trucked to southern Minnesota where it was fed corn from Iowa, processed into bacon in Iowa, and finally sent to a U.S. grocery store or back to Canada. Baby pigs, otherwise known as feeder pigs, are primarily born in Canada (most often in Manitoba) and then shipped to the United States when they are about 40 pounds. 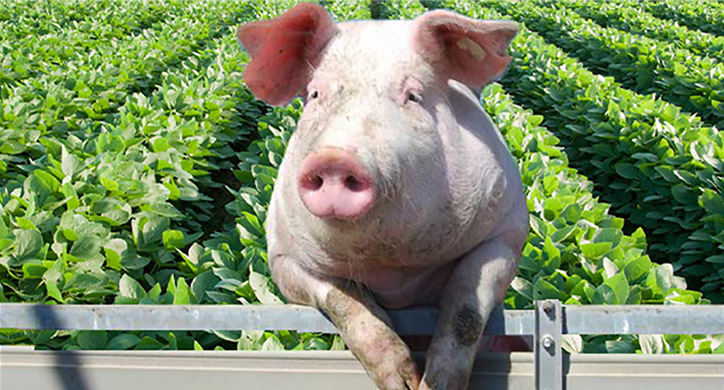 In 2016, 4.8 million feeder pigs were trucked to those states that have cheap access to corn. 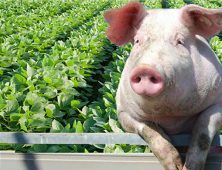 After they grow to their production size of 280 pounds in the U.S., they are ready to be processed into sausage, bacon, ham, tenderloin or chops. These finished pork products are then trucked back to Canada, across the U.S., and down to Mexico. Because of NAFTA, the pigs and the processed meat can flow back and forth across the border without taxes. As a result, the U.S. has 27% of the global pork export market, which benefits our farmers, and your morning bacon is made much more affordable! What if there were no NAFTA? If NAFTA is removed, each country would revert to the import tariffs put in place by the World Trade Organization. The average cost to export to Mexico would be 7.1%, to the U.S. 3.5% and to Canada 4.2%. However, this varies product by product. For instance, Mexico would charge a 75% tariff on chicken coming from the U.S. This would reduce chicken exports and force chicken suppliers to send their chicken to other countries or produce less. While some industries want to put a protectionist status on their products, having a competitive flow between borders creates more jobs. Economic growth allows more purchases and more products to be created. “Every $1.00 in ag exports generates an additional $1.27 in economic activity for the exporting country.” This is an increase of 127%! Free trade also provides a comparative advantage for the country that is producing a certain product. For instance, corn grows very well in the mid-west and is exported to Mexico for their animal feed. Or, if we’re looking again at growing blueberries in a North Dakota, an indoor environment just doesn’t make sense compared to importing blueberries grown in Mexico. U.S. demand for produce has helped farmers in Mexico generate more income and create secure jobs because they are able to easily export fresh fruits and vegetables like avocados, tomatoes, watermelon, and blueberries. As a result, these farmers can also invest in more sustainable farming, education, and food safety. They are able to use phosphate fertilizer instead of night soil. They can drive tractors instead of using oxen. They will then buy cars, clothes, and send their children to school. This is mutually beneficial for the United States because of the higher the Mexican GDP per capita – the better the likelihood that they import more products from the U.S. In speaking with 4th generation North Dakota farmer, Terry Wanzek, he emphasized the importance of NAFTA to American farmers as well as farmers in Canada and Mexico. Terry grows corn, wheat, and pinto beans. While discussing the beans, he said that about 70% a month goes to Mexico. He points out that if we didn’t have the agreement with Mexico then the demand for pinto beans would be far less, and the prices would not be enough to cover the production costs. What are the issues with NAFTA? NAFTA isn’t universally praised. The issue that President Trump has with NAFTA is that some of the trade with different products is not necessarily fair. As with any trade agreement, NAFTA demands adjustment for some sectors in all three nations. 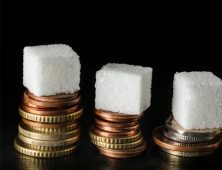 Some economic sectors that had enjoyed a safe national marketplace now have to deal with other competition and tougher economics. But overall, trade experts argue, each economy benefits as citizens gain the benefits that come from open, freer trade. There are still examples of where NAFTA can be modernized. For instance, while the food safety regulations are the same in both countries, meat crossing the border is subject to different standards. 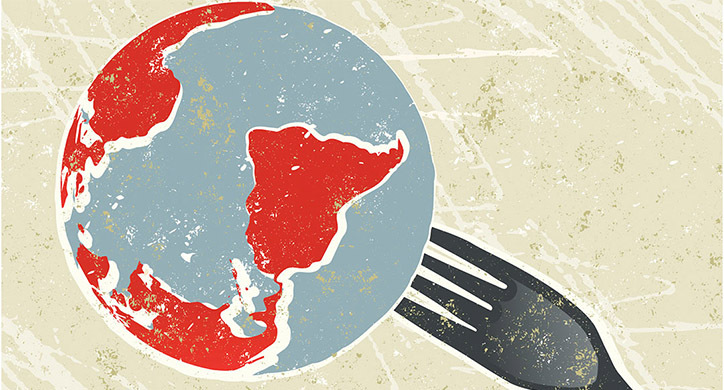 From the U.S. to Canada, meat can enter relatively easily. When meat comes from Canada to the U.S., there are inspection houses with set fees that slow down the transport – without an added benefit to food safety. Trade between Mexico, U.S., and Canada means that consumers in North Dakota can enjoy blueberries whenever they like, even in December. It means Mexican families can afford and enjoy more meals of beef, thanks to the feed grains imported from American farms. It means farmers in both Mexico and the United States can count on fertilizers from Canada to achieve optimal crop yields and optimal profits every year. 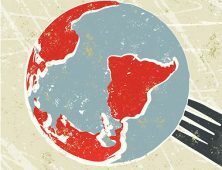 Free trade across borders of North American countries brings cheaper food to the grocery store, a larger variety of produce, and economic growth. Of course, there will always be those who do not benefit from free trade and there is always room for modernizing— but, if it was eliminated entirely the United States farmers could face financial trouble, and your food will lack variety and be more expensive.